This article makes out the case that the Kashmir problem is primarily rooted to the Jihadi ideology and religio-separatism of political Islam. What Are The Options For India Vis-À-Vis Sino-Japanese Rivalry? Credit goes to Mr Shinzo Abe, as he drove his liberal party to a second straight victory in Japan’s elections. When in 2012, Abe first won, he came on a platform of plain economic realities that Japan was facing. After four years of rule by LDP, Abe was propelled to the forefront to fix the shambles that Japanese economy was. After he came to power, his government took a little bit nationalistic tone. Abe, who is often compared to India’s PM Modi, as the new age conservative center right pragmatic leaders, is in that respect, the exact opposite to Modi. While Narendra Modi came with nationalistic overtones and turned to be a primarily trade and economics PM, Abe was in reverse. That probably worked, in his country, as Abe got re-elected with a supermajority in both the houses. It is a phenomenal achievement and, even though the economy remains stagnant, Abe’s victory in both the houses means, changes are coming. Shinzo Abe has long wanted to transform his country, and not just economically but bring back the heydays of the 1980s. He wants to fundamentally alter the state of his country. Abe wanted to change Japanese pacifist constitution, to what he says as “fit the times”. Abe said that, Japan needs to worry about its security posture with the changing times, as United States, the traditional power balancer and security provider in Asia, is in an accepted decline. The policy circles within the United States have open debate, if they need or are capable of carrying the security burden of stable and rich countries like Japan and Korea, and with the rise of Donald Trump, these debates are increasingly becoming public, thereby influencing policy decisions in alliance states like Japan as well. In that respect, Abe makes sense to his countrymen when, he states that Japan faces multiple growing and mutating threat scenarios and, is contemplating taking its own security destiny in its own hands. Women Join the Fighter Stream of the IAF: Will It Work? History shows that change often triggers misgivings, grumbling and active resistance, especially if the old order is threatened. But within a short time, most people adjust. This happened when women officers first joined the IAF and again when they were permitted to serve as transport and helicopter pilots. Therefore, it is unlikely that the induction of women as fighter pilots in the IAF will be as dramatic (or traumatic) as some might imagine. Across the world there is an increasing focus on women in the military. Although in most cases they are barred from combat, this is gradually changing. June 18, 2016, was a historic day for the Indian Air Force (IAF) and indeed for the entire Indian military establishment. On that day, three young women pilots were commissioned as Flying Officers and received their coveted wings from Union Minister for Defence, Manohar Parrikar, a crucial step towards joining the fighter stream of the IAF. It was at an Air Force Day gathering on October 08, 2015, that Air Chief Marshal Arup Raha, Chief of the Air Staff (CAS), made this rather low-key announcement, “We have women pilots flying transport aircraft and helicopters. We are now planning to induct them into the fighter stream to meet the aspirations of young women of India.” His statement came after many years during which the IAF and the Ministry of Defence (MoD) refused to consider the possibility of women in combat. But since then things have moved rapidly and the CAS appropriately enough chose International Women’s Day 2016 to reveal that the country would soon get its first batch of female fighter pilots. 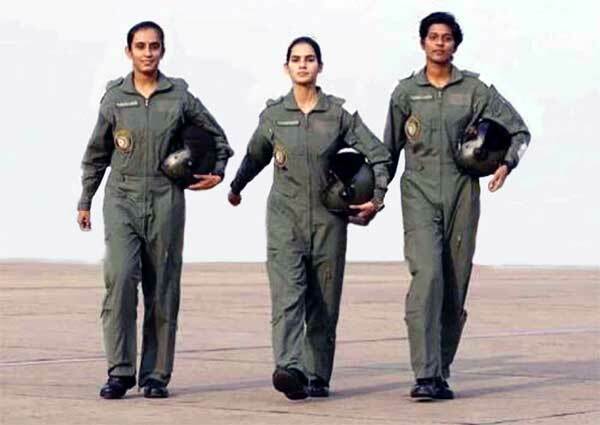 To dispel any impression that Bhawana Kanth, Mohana Singh and Avani Chaturvedi might end up as mere window dressing or public relations mascots he announced that they would later join regular fighter squadrons and fly along with their male counterparts. In ink: The US takes away more from the table. THE signing of the Logistics Exchange Memorandum of Agreement (LEMOA) in Washington on August 29 has generated controversy in India. The opposition parties — the Congress and Left parties, in particular — have voiced criticism. The UPA government was hesitant about signing this “foundational agreement” despite American urgings. The present government has not explained how or why the volte-face became necessary. LEMOA provides for the armed forces of the two countries to use the other globally for supplies, spare parts, services and refuelling. Effectively, the US forces could operate out of Indian bases on a simple basis. This is the first time India is allowing a foreign power such access to its military bases. Even in the halcyon days of Indo-Soviet friendship and cooperation, the two countries never felt the need for such a platform. India has fought more wars than most countries in modern history, but never felt the need for LEMOA, either. Of course, it is not on India’s mind to project power in faraway regions. From the US perspective, too, a military base in India as such is not a critical need when it has dozens of bases in the Indian Ocean region — spread out in Afghanistan, Qatar, Kuwait, Bahrain, UAE, Oman, Djibouti and Diego Garcia — to fight its wars or pursue its interventionist policies as the ‘world hegemon’. So, what is the raison d’etre of LEMOA? Paranjoy Guha Thakurta (paranjoy@epw.in) is editor, Economic & Political Weekly. Dr Sarpevalli Radhakrishnan is reputed to have been an eminent philosopher, an astute statesman and a brilliant orator. What is not generally known is that he made great contribution in publicising the literary works of Rabindranath Tagore among non-Bengali readers in India and abroad. In 2000, a few months after the Kargil War, an Indian submarine slipped out of her moorings in Mumbai harbour and headed into the north Arabian Sea. The INS Shalki, one of the navy’s quietest submarines, was on a specific mission. It was to track Pakistan’s newest acquisition, the French-built PNS Khalid, whose deployment had been indicated by Indian intelligence. The Shalki located the Khalid and tailed it for 45 minutes, her passive sonar stealthily recording acoustic readings and frequencies. The Khalid was oblivious to the shadowing and maintained normal transit speed, which allowed the Indian vessel to record its parameters. The Shalki had, in a single patrol, gained valuable data on Pakistan’s newest undersea combatant, the critical noise and equipment ‘signatures’ that would help the navy’s warships and aircraft track the submarine. On August 24, the Rupert Murdoch-owned broadsheet The Australian published documents on the vital parameters of India’s under-construction fleet of Scorpene-class submarines. India had signed a $3 billion deal with France in 2005 to indigenously assemble and build six Scorpene-class conventional submarines. The lead boat, the INS Kalvari, is on sea trials and slated to join the navy by the end of the year. Five others, being built at the Mazgaon Docks in Mumbai, will join the navy in one-year intervals by 2022. The ‘Edward Snowden-sized leak’, as the newspaper called the tranche of 22,400 documents, brought to the fore sensitive parameters of the submarines, that make them deadly undersea predators: “the frequencies they gather intelligence at, what levels of noise they make at various speeds and their diving depths, range and endurance and specifications of the submarine’s torpedo launch system and the combat system”. With Chinese influence growing in the subcontinent, India needs greater engagement with the big powers. During his visit to Vietnam last week, Prime Minister Narendra Modi and his interlocutors agreed to elevate their long standing military collaboration to a “comprehensive strategic partnership”. (Source: File) Political anxieties about India’s growing defence ties with Washington persist despite the NDA government’s repeated clarifications that the recent logistics support agreement is not about building a military alliance with the US. While the public debate on this issue is centred on high principles, Delhi’s policymakers are under compulsion to adapt to the rapidly evolving power shift in and around India’s neighbourhood. As a result, Indian foreign policy’s military dimension is likely to loom larger than ever before. Consider the following developments in the last few days: During his visit to Vietnam last week, Prime Minister Narendra Modi and his interlocutors agreed to elevate their long standing military collaboration to a “comprehensive strategic partnership”. In an intensification of India’s military commitment to Vietnam, the PM announced Delhi’s decision to extend a $500-million credit line to Hanoi for the purchase of Indian defence equipment. This is in addition to the $100-million defence credit offered some years ago. Another was the Afghan Taliban’s strong public criticism of India’s reported plans to step up military assistance to Kabul. In a statement on Sunday, Zabiullah Mujahid, the main spokesman for the Taliban, demanded that India stop “prolonging the lifespan” of the Kabul regime with its military aid. The collegium is the accused in this misappropriation of power case; it, therefore, has no business “sorting it out” amongst itself, when the government, the legislatures, and the people are an interested party in the outcome. Thus, the nation owes a vote of thanks to Justice Chelameswar, who said not once, but twice, that the collegium is not the best way to select and appoint judges to the upper judiciary. It finally needed a sitting judge and member of the unaccountable Supreme Court collegium to call a spade a spade. A few days ago, Justice J Chelameswar, the fifth senior-most judge in the Supreme Court, dashed off a letter to Chief Justice of India (CJI) TS Thakur that he will not be participating in the collegium’s future meetings due to its lack of transparency and failure to record its proceedings. An embarrassed CJI told the media that “we will sort it out”, when there is nothing to sort out behind closed doors. Issues of transparency and usurpation of the power to appoint judges are not matters to sort out by the collegium. The collegium is the accused in this misappropriation of power case; it, therefore, has no business “sorting it out” amongst itself, when the government, the legislatures, and the people are an interested party in the outcome. It is surprising that no one has been willing to say that the emperors of justice had no clothes. The nation thus owes a vote of thanks to Justice Chelameswar, who said not once, but twice, that the collegium is not the best way to select and appoint judges to the upper judiciary. Before he sent his recent letter to the CJI, Justice Chelameswar wrote a lone, but eloquently argued, dissenting note in the National Judicial Appointments Commission (NJAC) case where the majority opinion was to scrap it. Ina bid to promote awareness on Indian Army’s modernisation needs, discovering capabilities of the industry and encouraging long terms research in academia at various industrial hubs across the country, Indian Army is making all out efforts to reach out to the industry and academia in every nook and corner of the country. Supported by industry associations including CII and FICCI, the Indian Army under an effort spearheaded by India’s Deputy Chief of Army Staff, Lt General Subrata Saha, UYSM, YSM, VSM** and his team of senior army officers have been extensively interacting with industry bodies and academia to take forward its objective of modernising the Army’s need by way of indigenous solutions. These interactions are also in line with Prime Minister, Narendra Modi’s ‘Make in India Drive” and Defence Minister’s Manohar Parrikar’s push for modernisation through indigenization. To achieve this, the India Army’s team under Gen Saha has been seeking “Generation Next” solutions from the Industry while posing “Problem Definition” challenges to the academia to address its needs. About 20 plus such interactions have been held so far with the industry (that includes large, medium, small, MSMEs and start-ups) and academia (including various IITs and DRDO). These events provided an exclusive opportunity to the industry and academia representatives to understand the requirements and interact with the top brass of Indian Army and seek clarifications directly from the user. Later during his interactive session, Gen Saha and his team held discussions on the problems being faced by Startups & MSMEs in taking proven technology to “Finished Products” required by the user (Indian Army). At least 13 persons were killed and another 41 were injured when a suicide bomber blew himself up near the entrance of District and sessions court of Mardan District in Khyber Pakhtunkhwa (KP) on September 2, 2016. Four lawyers and three Policemen were among the dead. District Police Officer (DPO), Mardan, Faisal Shahzad said the attacker detonated a hand grenade before exploding his suicide vest. The bomb contained eight kilograms of explosive material, the DPO said, adding that security arrangements at the site of the attack helped mitigate the damage. The Tehreek-e-Taliban Pakistan (TTP) splinter, Jama’at-ul-Ahrar (JuA), claimed responsibility for the attack. If the suicide bomber had not been restricted at the security check point, the incident may well have been a replay of the August 8, 2016 Quetta Civil Hospital suicide attack, in which there were 55 lawyers among 74 people killed. The lawyer fraternity had gathered at the hospital to mourn the killing of Balochistan Bar Association (BBA) President Bilal Anwar Kasi in a gun attack earlier on August 8. The Mardan court suicide attack comes just hours after terrorists of JuA attacked the Christian Colony in the Warsak Dam area of provincial capital Peshawar in the morning of September 2. One civilian, one Levies official and four suicide bombers were killed in an exchange of fire with Security Forces (SFs) in that incident. Two Frontier Corps (FC) personnel, a Policeman and two private guards sustained injuries in the attack. Firing reportedly began around 6 am (PST), when terrorists wearing suicide jackets attacked the colony. Two of the attackers detonated their suicide jackets, while the other two were killed by SFs. Director General (DG) of Inter-Services Public Relations (ISPR) Lieutenant General Asim Bajwa confirmed “all four suicide bombers were killed”. Al Qaeda claims that two of Ayman al Zawahiri’s daughters and a third woman were released weeks ago in exchange for the son of General Ashfaq Pervez Kayani, Pakistan’s former spymaster who also served as the Chief of Army Staff until 2013. The 20th edition of Al Masra magazine, which was posted online in late August, featured the claim on its front page. Al Masra is produced by a media shop affiliated with Al Qaeda in the Arabian Peninsula (AQAP), but it reports on news from all parts of al Qaeda’s global network. The Long War Journal cannot independently confirm the hostage exchange. There does not appear to be any reporting in the Pakistani press indicating that Kayani’s son had been kidnapped, let alone involved in a high-profile hostage swap. Al Qaeda sources announced in early August that Zawahiri’s daughters had been released. Independent accounts indicate that the global jihadist organization had been trying to secure their release in exchange for the kidnapped sons of Pakistan’s elite. The editors of Al Masra included a box (seen on the right) highlighting the story on the front page and saying that “detaining” the “son of the Pakistani Army Commander” led to the release. The newsletter’s authors claimed a series of tweets posted online in mid-August provided the insider details of the story. A pdf of the tweets, with accompanying images, can be viewed here. WARNING: The tweets include graphic images of an alleged Pakistani spy beheaded by al Qaeda for supposedly leading authorities to Zawahiri’s daughters. The last dozen years have been tumultuous for maritime Southeast Asia. Twelve years ago, a tsunami killed a quarter-million people in Indonesia and Thailand. Since then, cyclones, typhoons, tsunamis, and coastal floods have killed hundreds of thousands and impacted millions more. The same period witnessed three airliners crash into the ocean and a fourth simply disappear. Pirates attacked more than one thousand ships and hundreds of people have been killed in ferry disasters, 116 of them aboard a ship that dramatically sank in Manila Bay after a terrorist bombing. Recognizing that forces of nature, lost aircraft, drifting ships, terrorists, and criminals do not respect political boundaries, the maritime security forces of the region have amped up multinational cooperation both with each other and with extra-regional partners such as the United States. The U.S. Navy has readily taken part in multilateral cooperation in the region, using its expanding fleet capabilities to execute operations while simultaneously modernizing its exercises to advance regional maritime security capacity. Recent Southeast Asian multinational maritime crisis operations involving the U.S. Navy include the 2004 Indian Ocean tsunami response, relief operations after Typhoon Yolanda, and the searches for Malaysian Airlines flightMH370 and AirAsia flight QZ8501. Decades have passed since the U.S. Navy has participated in a strictly bilateral naval operation in Southeast Asia. It is almost impossible to imagine a future scenario where the United States would respond to a regional maritime crisis on a bilateral basis. Yet there is a disconnect here between operations and training. In contrast to the growth in multilateral operations, the bulk of U.S. maritime security training in Southeast Asia have remained bilateral. Experiences from recent multinational operations have demonstrated that the challenges associated with bringing together a wide range of capabilities, skill levels, and communications protocols are among the most formidable barriers to operational success. To better align operations and training, the U.S. Seventh Fleet and its regional partners are now seeking to introduce new multilateral elements into previously bilateral exercises. (FPRI) — Over the last few months, Vietnam has quietly deployed the components of several Extended Range Artillery (EXTRA) rocket systems to five of the islands that it occupies in the Spratly archipelago, according to Western officials. If true, Vietnam likely did so in response to China’s construction of military facilities on the islands that it controls across the region. Vietnam has reportedly dispersed and camouflaged the EXTRA rocket systems, but can arm them within days. While Vietnam currently lacks the real-time surveillance and reconnaissance needed for the systems to target ships at sea, they can put at risk China’s island bases. With a maximum range of 150 km and an accuracy of within 10 meters, they could render inoperable many of China’s newly built airfields. While China’s quantum science satellite (QSS) project is part of the Strategic Priority Programme on Space Science, the country’s first space exploration programme intended purely for scientific research, its experiments have significant military implications. On August 16, 2016 China launched the world’s first quantum communications experiment satellite into orbit from the Jiuquan Satellite Launch Centre in the Gobi Desert. The small satellite, recently named Micius after an ancient Chinese philosopher, is tasked to establish a hack-proof communication line – a quantum key distribution network, while performing a series of quantum entanglement experiments in space for the first time. The quantum science satellite (QSS) programme is the third mission of the 2011 Strategic Priority Programme on Space Science that includes a series of satellite launches between 2015 and 2030 to explore black holes, dark matter, and cosmic background radiation. Research on quantum technology is also a key priority, including in the 13th Five-Year Plan, China’s latest economic blueprint for research and development released in March 2016. The QSS is sponsored and managed by the China Academy of Sciences (CAS), and led by chief scientist Pan Jianwei. Its mission payload was developed jointly by the CAS’s Shanghai Institute of Technical Physics (SITP) and the University of Science and Technology of China (USTC). How is China training its ground-based air defense units, and what insights can this training provide for assessing Chinese air defense capabilities? In what way do PLAAF SAM training activities shape operational effectiveness at the unit level? What are the key themes, strengths, and weaknesses of training conducted by PLAAF SAM units? This report analyzes key trends and themes in China's People's Liberation Army Air Force (PLAAF) surface-to-air missile (SAM) unit training. After providing background information on China's air defense forces, the report introduces the basics of PLAAF SAM training, including training requirements, trends in recent training activities, and analysis of training themes. Based on this research, we found that PLAAF SAM units are improving their capabilities, although progress is uneven and capabilities may vary significantly between similarly equipped units. Based on data collected on PLAAF SAM training activities, the intensity of SAM training varies across China's former seven military regions. SAM units near the capital area and in the coastal regions appear to be most active. SAM units follow a yearly training cycle, with training peaking during the summer and early fall. Content-wise, PLAAF SAM units are engaging in more realistic and challenging combat training compared with the mid-2000s. They have increased the duration and difficulty of their training, continue to emphasize denial and deception tactics, and focus significant efforts on countering low- and extreme-low-altitude targets. SAM units are engaging in substantial mobility and night training, but face logistical hurdles that undercut their ability to rapidly move to operating locations and safety concerns that hinder their ability to engage in difficult and sophisticated training. There is limited joint and combined-arms training, but units appear to be moving beyond simple altitude de-confliction toward sharing data, employing more sophisticated target identification methods, and coordinating firepower with aviation units. "For, in the final analysis, our most basic common link is that we all inhabit this small planet. We all breathe the same air." I've been in China meeting with members of the International Monetary Fund (IMF) and the New Development Bank (NDB, launched by the BRICS). Here's what I found out: Green is the new black. As Jim Rickards has explained, the shift away from the dollar as the world's reserve currency creates an opening for a new global superpower. Other countries are making their moves to fill that spot, and none is moving more quickly than China. A massive part of world dominance is control over energy. Before, that meant oil. Now, it means green energy. The U.S. and China are racing to control green energy. For China, that's how they can clinch the title of new world superpower. For the U.S., it's a last-ditch effort to hold their ground. Since March 2011, observers of the Syrian conflict watched with anticipation the behavior of Syria’s security forces, hoping that they would eventually follow the examples of the Tunisian, Egyptian, or Libyan security forces during the heady days of the Arab spring. Yet after five years, the Syrian security forces remain largely loyal to the Assad regime, with no shift in sight. Indeed, the Assad regime’s endurance is explained by the steadfast loyalty of the top brass of the Syrian Arab Army and the myriad security and intelligence agencies. Their refusal to abandon the regime’s pursuit of a security solution — despite pleas by peaceful protestors from the early days of the uprising for the army to stand with them — can now be seen as one of the main reasons that ensured this civil war would be a long one. As the regime escalated its violent response to protests, defections did accelerate. But aside from occasional cases of high-ranking defectors who were already outside the trusted security circles, the majority of defections were non-commissioned officers or conscripts. Those mainly joined the Free Syrian Army (FSA) or fled the country with their families to escape retaliation. The few cases of high-ranking defections in the first two years of the war had aninsignificant impact on the calculations of the regime, its decision-making process, and the morale of security forces, which were largely able to maintain cohesion and resilience. The regime has shielded itself against the risk of coups, key defections and fragmentation through a decades-long process of integrating and embedding into the security establishment both clan members and loyalist Alawites, followers of the esoteric offshoot of Shia Islam that the Assad family belongs to. The composition of security forces and the concentration of leadership into a very narrow cohort of individuals and families — most of which are now under E.U. and U.S. sanctions — has served the ultimate purpose of protecting the ruling family from a perennial threat of a Sunni-led revolt. Given this sectarian structure and its dynamics, it is not surprising that noticeable high-ranking military defections from core leadership have not occurred. The seemingly paradoxical ability of a “minoritarian” regime to withstand more than five years of onslaught in what has largely become a sectarian proxy-war owes itself to the politics of sectarian stacking in the military, which exacerbated Sunni officers’ grievances and alienation. The Eastern Economic Forum (EEF) was held in Vladivostok, Russia, on 2 September 2016, a day before the G-20 Summit Meet in Hangzhou, China It was attended by the Russian President Vladimir Putin, Japanese Prime Minister Shinzo Abe, the South Korean President Park Geun-hye and the Australian Prime Minister Malcolm Turnbull. On the sidelines of the EEF, a bilateral meeting between the leaders of Russia and South Korea was also held. During this meeting, the Russian leader surprised his South Korean counterpart by giving her a special gift. It was a work of calligraphy, written in Chinese, by Park’s father, the late former President Park Chung-hee in 1979 (the year he was assassinated), which read, “with strong teamwork, let’s move forward together.” It was indeed a special gesture from Putin. Ahead of the bilateral talks, South Korea was concerned that its consent for the US-led THAAD battery on the peninsula meant that Russia-South Korea relations would be strained beyond repair. It was a pleasant surprise for the South Korean leader that even though Russia had gone along with China in its criticism of the THAAD installation on the Peninsula, it wanted to continue economic and other cooperation with South Korea. Putin stressed after the meeting that he “had in-depth discussions about the current situation on the Korean Peninsula and reached an agreement that the two nations do not accept the self-proclaimed nuclear status of Pyongyang.” Furthermore, both the leaders also agreed to begin negotiations on a free trade agreement (FTA) between South Korea and the Russia-led Eurasian Economic Union (EAEU), which consists of Russia, Armenia, Belarus, Kazakhstan, and Kyrgyzstan. The feasibility study on this has already been concluded and the process of negotiations may begin in October 2016. In addition to this Russia and South Korea signed 24 MoUs, thereby expanding the range of their bilateral cooperation. Five years ago, Stanford economist Geoffrey Rothwell and Berkeley economist Lucas Davis made a $20 bet on the cost of two nuclear reactors under construction in Georgia. Rothwell wagered that units three and four at Georgia Power's Vogtle Electric Generating Plant would cost less than $4,200 per kilowatt of capacity. Davis bet they would cost more. "I went easy on Geoff and agreed to exclude financing costs and focus only on the 'overnight' cost of construction," quips Davis, who heads the Energy Institute in the Haas School of Business at the University of California, Berkeley. "I can't remember whether we used 2007 dollars or 2011 dollars," hedges Rothwell, who retired from Stanford University to become principal economist for the Nuclear Energy Agency at the Organisation for Economic Co-operation and Development. Davis and Rothwell are not the first to gamble on the high upfront costs of nuclear power plants. Nuclear construction boomed in the 1960s and early 1970s, but in the mid-1970s, rising electricity prices triggered increased scrutiny of utilities' capital expenditures. Safety and environmental fears also intensified in 1979 when a film called The China Syndrome portrayed a nuclear power plant on the verge of a total meltdown. The movie debuted 12 days before a partial meltdown occurred at Three Mile Island in Pennsylvania. No one got hurt, but the incident created a sense of panic that radiated throughout the nation. Orders for new reactors dwindled to zero in the United States, but most American reactors continued to deliver clean, reliable, low-cost power for decades with no major problems. In response to growing fears of global warming, the Environmental Protection Agency has issued restrictions on carbon-dioxide emissions from power plants. India has been witnessing rapid urbanisation in the last decade, particularly in its large and medium-size cities. As more and more people move towards cities and towns, it is imperative to build an understanding of how cities are geared in terms of growth and inclusion. In what ways do India’s marginalised communities get excluded from the country’s growing urban spaces? This paper studies how individuals and groups are included in — or excluded from — urban transitions. It is based on an empirical examination of inclusion in three Indian cities, part of a project of ORF with the Peace Research Institute Oslo (PRIO) in Norway, and also describes the processes of exclusion that have become embedded in India’s urban spaces. Darren E. Tromblay has served as an intelligence analyst with the U.S. government for more than a decade. He holds an MA from the Elliott School of International Affairs at George Washington University, an MS from the National Defense Intelligence College, and a BA from the University of California and is a graduate of the National Intelligence University’s Denial and Deception Advanced Studies Program. Mr. Tromblay is the author of The U.S. Domestic Intelligence Enterprise, published by Taylor & Francis in 2016 and a co-author of Securing U.S. Innovation, which will be published by Rowman & Littlefield later this year, and has been published by Intelligence and National Security, Small Wars Journal, and the International Journal of Intelligence Ethics. He can be reachedat Tromblay@gwu.edu. The views expressed in this essay are entirely and solely the author’s rather than those of any U.S. government agency. EXECUTIVE SUMMARY: Israel’s young cyber industry is proving to be a remarkable success story. Between the National Cyber Bureau and the budding Cyber Defense Agency, Israel can protect its critical infrastructure and continue cementing its position as a global cybersecurity powerhouse. Sometimes dramatic advances are made in important fields far from the public eye, overshadowed by senseless media uproars over insignificant things. One of these leaps was made a month ago when Israel's cybersecurity legislation entered a new phase. After prolonged discussions, the Knesset voted in favor of a temporary provision laying the groundwork for Israel's civilian cyber defenses. In 2012, following the recommendations of a committee headed by Maj. Gen. (res.) Isaac Ben-Israel, the National Cyber Bureau (NCB) was established at the Prime Minister's Office. The NCB has come a long way since then, and its framework of principles allows Israel to better protect its civilian cyber infrastructures. This was a case in which the quality of the human capital involved in the government's efforts would have significant impact on the fate of the initiative. A high bar was set for those involved with the NCB. They would have to be top-notch individuals, ready and willing to dedicate their time, energy and skills to a project whose objectives are sometimes ambiguous.